"Friendship comes in many colors." Lionsgate has debuted the colorful official trailer for the long-awaited, highly anticipated animated My Little Pony: The Movie. 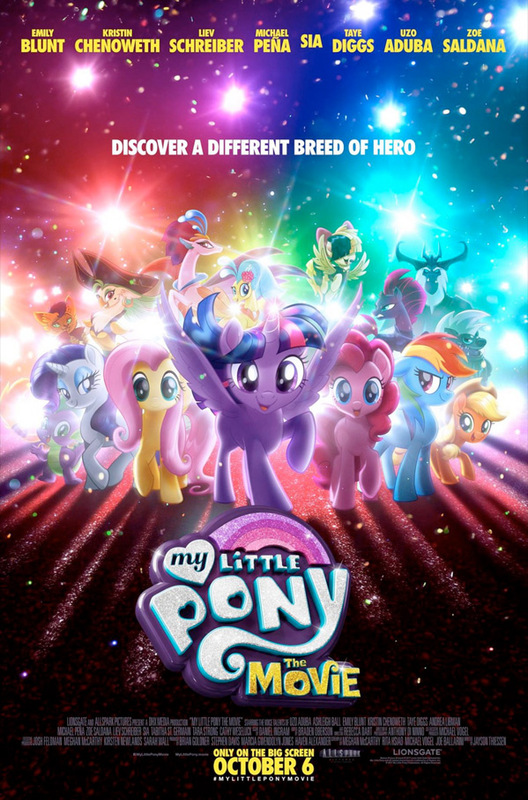 Indeed, we've been hearing rumors about a My Little Pony movie and it's finally here - hitting theaters in October! I think I would be more excited for this if it were a live-action/hybrid movie, but it's just a full-length feature based on all the animated TV shows and videos already available. When a dark force threatens Ponyville and the Mane 6, they go on a journey to the end of Equestria to save their beloved home. Featuring the voices of Zoe Saldana, Kristin Chenoweth, Emily Blunt, Uzo Aduba, Liev Schreiber, Michael Peña, Tara Strong, Taye Diggs, and Sia; as well as all the original voices from the TV shows as the Mane 6. This looks totally friend-tastic charming! Enjoy. A new dark force threatens Ponyville, and the Mane 6 -- Twilight Sparkle, Applejack, Rainbow Dash, Pinkie Pie, Fluttershy, and Rarity -- embark on an unforgettable journey beyond Equestria where they meet new friends and exciting challenges on a quest to use the magic of friendship and save their home. My Little Pony: The Movie is directed by filmmaker Jayson Thiessen, of extensive My Little Pony work previously, including over 100 episodes of "My Little Pony: Friendship Is Magic" and a few short films previously. The screenplay is written by Meghan McCarthy and Rita Hsiao and Michael Vogel. Lionsgate will release Thiessen's My Little Pony: The Movie in theaters everywhere starting October 6th later in the fall. For more info, visit the official website or follow @MLPMovie for the latest updates. So what do you think?